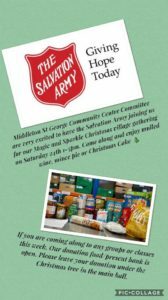 Middleton St. George Community Association will be holding its annual Christmas Community Event ‘Magic and Sparkle’ this coming Saturday, the 24th November from 1 p.m. to 5 p.m. in the Community Centre. The event is free to attend. Spare change and donations to help us access the grant the Community Centre has been awarded of up to £55,000 but 10% of this fund needs to be raised and the deadline is the 25th November. 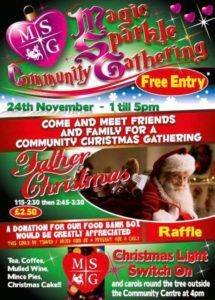 Anything residents are able to offer would be gratefully received and it will all go towards the Community Centre’s grant fund.